After raising records amounts of cash for her presidential run ($175MM thus far), and then spending it unwisely, Hillary's "Inevitable" campaign and the vaunted Clinton money machine is sputtering. Actually, the wheels started to fall off as early as late January-- just a few weeks into the primary season--when Hillary was forced to "loan" her campaign $5 million. The campaign stayed afloat by squeezing their small but ardent group of money people hard for more cash, spinning the media, and by doing well in Ohio and Texas (aided by Rush Limbaugh's sinister Operation Chaos). Doomed by an unlikable candidate and its toxic racial tactics, the Clinton machine is has been sputtering. While MSM allies pretend otherwise, the campaign is sinking in the polls nationally, losing support from party leaders, African Americans and progressives. Hillary has attempted a presidential run while donning the highest negative ratings of any candidate in recent memory. For example, polls a year ago showed that upwards of 52% of voters viewed her unfavorably. After a week of desperately trying to raise Obama's negatives, Clintonistas, Bill, FOX, Rush, Hannity, Scaife, Rupert, et. al., have only managed to make Hillary even more unlikable. Now, only 37% of Americans have a positive view of New York's reincarnation of the Queen of Mean. According to an adviser (Jim Vandehei & Mike Allen, Story behind the story: The Clinton Myth, Politico - 3.21.08), Hillary Clinton had no more than a 10 percent chance of getting the nomination. Now, Columnist David Brooks (The Long Defeat, NYTimes -3.25.08), believes she’s probably down to a 5 percent chance. Yet, Bill, FOX, Hillary, and her band of fanatics, continue carpet bombing Obama--along with the Democrat's presidential chances in '08. New Mexico Gov.Bill Richardson, the nation's only Latino governor, is endorsing Sen. Barack Obama for president, calling him a "once-in-a-lifetime leader" who can unite the nation and restore America's international leadership. "I believe he is the kind of once-in-a-lifetime leader that can bring our nation together and restore America's moral leadership in the world. As a presidential candidate, I know full well Sen. Obama's unique moral ability to inspire the American people to confront our urgent challenges at home and abroad in a spirit of bipartisanship and reconciliation." 1) It signals to the all-mighty super-delegates of the Democrat Party that a major one time loyal Clintonite has more faith in Obama than in Hillary. 2) It immediately puts pressure on super delegates in Florida and Southwest--areas Obama lost to Hillary largely due to the Latino vote. 3) It better positions Obama against a McCain match-up in states with heavy Latino populations that the GOP thinks McCain can win. 4) It answers the question about Obama's preparedness to lead because Richardson is viewed by many as the best prepared to be president by virtual of his deep and multi-layered governmental experience. 5) And it tells all decent Americans tired of divisive politics that Obama can be trusted as to serve as a uniter. Some of us would have preferred Richardson's endorsement prior to the Texas primary. It could have taken some of the steam out of the Clintonistas-Fox-Rush Axis. On the other hand, there's value to the nation to have witnessed what has transpired, the dirty tricks, racist commentary, attempts at character assassination, stealing passport information, etc. Voters have witnessed the strength of character and decency of Obama versus the nastiness and divisness of Rush, Hannity, Coulter and Hillary. It's Good Friday 2008 and today's lesson is an age old one: Stop the hate and division of the past and grow strong as a united people of God. Yes, We Can ! Si, Se Puede! 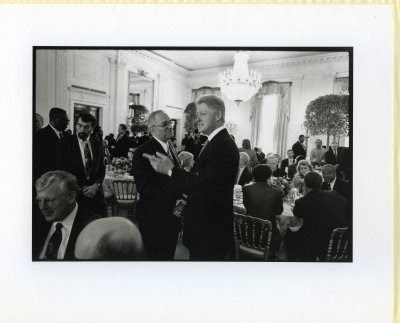 Bill Clinton thought enough of Trinity Church's Rev. Wright to invite him to the White House twice. Now that Hillary is running against Senator Obama, Rev. Wright is worthy only of being trashed. On Tuesday Obama, whose momentum was evaporating in the heat of his pastor scandal and poor Pennsylvania poll numbers, did what he had to do. He did more than that, actually. He stepped to the plate and swung for the fences. Obama gave the best, straightest talk on American race relations ever heard from a national politician. Whatever you might think of Obama, you can't say he has taken the easy way out with a speech like this - he's taken the time to confront some very unpleasant truths about race in America. And he has done it in a nuanced manner that is pretty much unprecedented for campaign rhetoric. The pundits were clearly stunned. They knew they had witnessed something extraordinary, a moment when time seemed to stand still and a politician in the midst of a withering electoral storm did the unspeakable: he spoke the truth. If Barack Obama is elected president, his speech on race in America will be remembered as one of the greatest in the country's history. If he loses, it will still be remembered as a terrific speech, an astonishing display of grace under pressure. The rhetorical magic of the speech—what made it extraordinary—was that it was, at once, both unequivocal and healing. There were no weasel words, no Bushian platitudes or Clintonian verb-parsing. With his brilliant speech on race relations yesterday at the National Constitution Center, Barack Obama showed why his campaign for president has the aura of a mission. Obama sounds like cool blues. The calmness of style, the strength of his self-confidence, pull us through the nervousness. If people have the opportunity to hear him in full and think about it, they will recognize the strength it took for him to open his arms this way, casting aside all defenses and evasions. With the hope and everything else he stands for, this guy is one very strong character. "That was the most sophisticated speech on race and politics I've ever heard," said CNN's Bill Schneider, the only network pundit who actually has taught American political history at elite universities. It was all the more remarkable because, while Kennedy presided over what may have been the greatest speech-writing team in electoral history, Obama -- like Lincoln -- wrote his address himself, completing the final draft Monday night. ...[T]he image of the first viable black presidential candidate confronting America's racial history head-on was a striking one. Not in decades has a prominent candidate so bluntly tackled the issue of prejudice. The address invited comparisons to John F. Kennedy's speech on his Catholic faith almost a half-century ago. Tuesday morning, in what may be remembered as a landmark speech regardless of who becomes the next president, Obama established new parameters for a dialogue on race in America that might actually lead somewhere -- that might break out of the sour stasis of grievance and countergrievance, of insensitivity and hypersensitivity, of mutual mistrust. I have never felt more convinced that this man's candidacy - not this man, his candidacy - and what he can bring us to achieve - is an historic opportunity. This was a testing; and he did not merely pass it by uttering safe bromides. He addressed the intimate, painful love he has for an imperfect and sometimes embittered man. And how that love enables him to see that man's faults and pain as well as his promise. This is what my faith is about. It is what the Gospels are about. This is a candidate who does not merely speak as a Christian. He acts like a Christian. Speaking in Philadelphia, Obama celebrated his own racial heritage but also demonstrated his ability to view the black community with a measure of objectivity and, when necessary, criticism—caring criticism. But this was no Sister Souljah moment. He did not sacrifice Wright for political ends. He hailed the good deeds of his former minister, noting that Wright's claim that America continues to be a racist society is rooted in Wright's generational experiences. And Obama identified the sources of racial resentment held by whites without being judgmental. With this address, Obama was trying to show the nation a pathway to a society free of racial gridlock and denial. Moreover, he declared that bridging the very real racial divide of today is essential to forging the popular coalition necessary to transform America into a society with a universal and effective health care system, an education system that serves poor and rich children, and an economy that yields a decent-paying jobs for all. Obama was not playing the race card. He was shooting the moon. It was a bold speech delivered with the feeling of great authenticity and solemn sincerity, and it's hard to imagine someone more uniquely qualified to deliver that dose of reality than a man who was the product of a black father and white mother. Barack Obama's hearalded speech on race is the most honest appraisal of racial problems in America I can remember a politician ever giving. I think this is the kind of speech I think first graders should see, people in the last year of college should see before they go out in the world. This should be, to me, an American tract. Something that you just check in with, now and then, like reading Great Gatsby and Huckleberry Finn. Read this speech, once in a while, ladies and gentlemen. This is us. It's us with the scab ripped off. In a speech whose frankness about race many historians said could be likened only to speeches by Presidents Lyndon B. Johnson, John F. Kennedy and Abraham Lincoln, Senator Barack Obama, speaking across the street from where the Constitution was written, traced the country’s race problem back to not simply the country’s "original sin of slavery" but the protections for it embedded in the Constitution. ...[T]he bigger and more basic reason the speech was a success is that Mr. Obama, like Bill Clinton and Ronald Reagan before him, has something powerful and rather rare working in his favor: Most Americans instinctively like him and want to give him the benefit of the doubt. And Mr. Obama delivered for them on Tuesday. SNL funnyman Tracy Morgan offers his perspective on the current dust-up involving Barack Obama, the pastor, race and Hillary Clinton. Produced by Obama supporter and DailyKos diarist DannyB, 'O'Bama Boy' is in honor of St. Patrick's Day and set to the tune of 'Danny Boy'. The Irish Tenor is DannyB himself. I love the ending to the related diary: O'bama '08 - Luck of the Irish to ya! Keith Olbermann gives Hillary Clinton a well-deserved tongue lashing for her campaign's continued race-baiting. I'm impressed that someone as prominent as Olbermann is finally calling Hillary out. However, the sad truth is that the Clintons want the attention Geraldine Ferraro's racist comments are receiving from the media. Race-baiting through surrogates is clearly part of the Clintons MO--even if so many of their supporters are in denial about it. The pattern has been the same. Someone connected to her campaign says makes a racist remark shortly before a primary. The person claims they didn't mean for what they said to come off the way it did. Hillary gives a weak apology. And the media idiotically pretend that both Clinton and Obama are equally at fault. But the damage to the Obama campaign is done--and Hillary has paid little to nothing for it. BTW: Geraldine's comments were designed to peal away any White blue collar voters support in upcoming primary states of Pennsylvania, West Virginia and Indiana. Worst, Geraldine is now "free" to fire away at Obama as a free-lance Clintonista from her perch as a FoxNews commenator. How lovely. 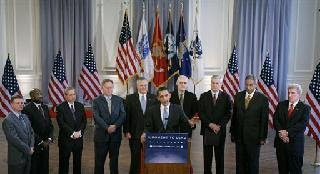 Democratic presidential hopeful Sen. Barack Obama D-Ill., accompanied by military leaders from the U.S. armed forces, takes part in a news conference in Chicago, Wednesday, March 12, 2008. Citing his judgment and ability to lead, admirals and generals from the United States Army, Navy and Air Force that together have served under the last nine Commanders-in-Chief today announced their endorsement of Obama for president. It is my privilege to be joined by some of the distinguished generals and admirals supporting my campaign. They have defended the American people and stood up for American values with honor and distinction. Between them they have served nine Commanders-in-Chief, and I look forward to continuing to draw on their counsel throughout my campaign and beyond. As as a candidate for the presidency, I know that I am running to be Commander-in-Chief – to safeguard this nation's security, and to keep our sacred trust with the men and women who serve. There is no responsibility that I take more seriously. This is something that I've talked about throughout this campaign. Because I believe that any candidate for President must present the American people with a clear vision of how we will lead. There are real differences between the candidates, and important issues to debate – from ending the war in Iraq, to combating terrorism, to devising new strategies and new capabilities to confront 21st century threats. But recently, we've seen a different kind of approach. Instead of a serious, substantive debate, we've heard vague allusions to a "Commander-in-Chief threshold" that seems to be about nothing more than the number of years you've spent in Washington. This is exactly what's wrong with the national security debate in Washington. After years of a divisive politics that uses national security as a wedge to drive us apart, how much longer do we have to wait to bring this country together to confront our common enemies? After years of being told that Democrats have to talk, act and vote like John McCain to pass some Commander-in-Chief test, how many times do we have to learn that tough talk is not a substitute for sound judgment? After years of a war in Iraq that should've never been authorized, how many more politicians will appeal to the American peoples' fears instead of their hopes? This moment – in this election – is our chance to put an end to a divisive politics that has done nothing to keep America safe, or to serve our men and women in uniform as well as they are serving us. Because the real Commander-in-Chief threshold doesn't have to do with years tallied up in Washington, it has to do with the judgment and vision that you will bring to the Oval Office. On the most important national security question since the Cold War, I am the only candidate who opposed the war in Iraq from the beginning. This judgment was not about speeches, it was about whether or not the United States of America would go to war in Iraq. Because we did, we took our eye off al Qaeda; we have lost thousands of lives and spent hundreds of billions of dollars; our military is overstretched; and our security and standing has been set back. So don't tell me that the decision to go to war was just a speech, because it was far more than that to the men and women who have served – and continue to serve heroically in Iraq. When I spoke out against the war, I said that I was not opposed to all wars. In fact, one of the central reasons why I opposed going to war in Iraq is that we had yet to finish the fight against al Qaeda and the Taliban. That remains true today. That is why I have consistently called for an increased commitment to Afghanistan, and why I called last August for at least two additional combat brigades to support our mission there. And that is why I will end the war in Iraq when I am President, and focus on finishing the job in Afghanistan. I will never hesitate to defend this country and our critical interests. That is why I am the only candidate who has made it clear that we cannot tolerate any safe-haven for terrorists who threaten America. But we must also use all elements of national power to combat the threats of the 21st century, and that means deploying the power of American diplomacy before we deploy our troops. That is why we must be willing to talk to the leaders of all nations – friend and foe. The threats we face are increasingly unconventional, and they call for new approaches. I have worked on the Senate Foreign Relations Committee to combat the challenges of the 21st Century – securing loose weapons and nuclear materials from terrorists; working to stop ethnic killing and genocide in Africa; and investing in our ability to combat epidemic diseases like avian flu that can be deadly at home and sew instability abroad. And one theme that I hear in talking to military officers – whether generals and admirals, or the mid-level officers who will lead tomorrow's military – is that we need new capabilities to respond to this century's new threats. We must maintain our overwhelming conventional advantage – and I will. We also need to increase the size of our ground forces by 65,000 soldiers and 27,000 marines to relieve the strain on our troops, and to increase our capacity to put boots on the ground. We need to invest in capabilities like civil affairs, foreign languages, and training foreign militaries, so that we can confront nimble enemies. We need to give our civilian agencies the ability to operate alongside our military in post-conflict zones and on humanitarian missions. And we must inspire a new generation of Americans to serve their country, in the military and in a civilian capacity. And let me be very clear: when I am Commander-in-Chief, I will seek out, listen to, and respect the views of military commanders. Under this Administration, too often we have seen civilian control turned into an expectation that the uniformed military will be punished if they tell the President what he needs to know, rather than what he wants to hear. When I am President, the buck will stop with me, but we will restore trust and open dialogue between the military and civilian leadership. Finally, it is the sacred obligation of any Commander in Chief to give the men and women who have served the care and support they have earned. That is what I have tried to do on the Senate Veterans Affairs Committee – working to improve care and benefits for wounded warriors and their families, and to enhance screening and treatment for PTSD and Traumatic Brain Injury, the signature wounds of the wars in Iraq and Afghanistan. As President, I will ask myself every day whether I am serving our troops and veterans as well as they have served America. That means only sending them into harm's way when we absolutely must; providing them with a clear mission and the equipment they need to do the job; standing by them when they come home; and helping them live their dreams after they leave the service. Like the men who have joined me on this stage today, my story is only possible in America. It is the story of my grandfather, who marched in Patton's Army; and my father, who crossed the globe to be a part of the dream that my grandfather defended. An America that secures its people, and stands as a light of hope for the world. That is the America that I will defend as Commander-in-Chief, drawing on the counsel of military commanders and the courage and conviction of the American people. An America where we meet the challenges of the 21st century with sound judgment, clear plans, and a common purpose. When we won Iowa, the Clinton campaign said it's not the number of states you win, it's "a contest for delegates." When we won a significant lead in delegates, they said it's really about which states you win. When we won predominantly white, rural states like Idaho, Utah, and Nebraska, they said those didn't count because they won't be competitive in the general election. When we won in Washington State, Wisconsin, and Missouri -- general election battlegrounds where polls show Barack is a stronger candidate against John McCain -- the Clinton campaign attacked those voters as "latte-sipping" elitists. And now that we've won more than twice as many states, the Clinton spin is that only certain states really count. For all their attempts to discount, distract, and distort, we have won more delegates, more states, and more votes. Meanwhile, more than half of the votes that Senator Clinton has won so far have come from just five states. And in four of these five states, polls show that Barack would be a stronger general election candidate against McCain than Clinton. We're ready to take on John McCain. But we also need to build operations in places like Pennsylvania, Indiana, North Carolina, and Oregon that will hold their primaries in April and May. With our overwhelming victory in the Mississippi primary yesterday, our lead in earned delegates is now wider than it was on March 3rd, before the contests in Ohio and Texas. And thanks to your help, we have dramatically increased our support among so-called "superdelegates" -- Governors, Members of Congress, and party officials who have a vote at the Democratic National Convention in August. As the number of remaining delegates dwindles, Hillary Clinton's path to the nomination seems less and less plausible. Now that Mississippi is behind us, we move on to the next ten contests. The Clinton campaign would like to focus your attention only on Pennsylvania -- a state in which they have already declared that they are "unbeatable." But Pennsylvania is only one of those 10 remaining contests, each important in terms of allocating delegates and ultimately deciding who our nominee will be. We have activated our volunteer networks in each of these upcoming battlegrounds. We're putting staff on the ground and building our organization everywhere. The key to victory is not who wins the states that the Clinton campaign thinks are important. The key to victory is realizing that every vote and every voter matters. Throughout this entire process, the Clinton campaign has cherry-picked states, diminished caucuses, and moved the goal posts to create a shifting, twisted rationale for why they should win the nomination despite winning fewer primaries, fewer states, fewer delegates, and fewer votes. We must stand up to the same-old Washington politics. 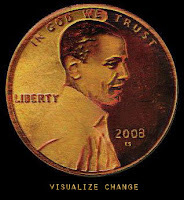 Barack has won twice as many states, large and small, in every region of the country -- many by landslide margins. And this movement is expanding the base of the Democratic Party by attracting new voters in record numbers and bringing those who had lost hope back into the political process. Thank you for your support and for everything you've done to build a movement that is engaging voters and winning contests in every part of this country. Click here for Handelsman's It's 3 a.m. version and here for more of his award-winning animations. While you're viewing, check out this sampling of just a few of the It's 3 a.m. videos circulating in cyberspace: here, here, here and here. In 6 years as a member of the Board of Directors of Arkansas-based WalMart Corporation, Hillary Clinton never once spoke up against the company's anti-union policies. The record shows there was not a peep from her in the 4 public stock-holder meetings and 24 board of directors meetings she attended. Nor, btw, did she speak up against WalMart's use of foreign sweatshops--some of which employed children as young as eleven. Perhaps more frightening is that this video captures some of the chameleon that is Hillary. People do change over time some, but "New York" Hillary and "WalMart" Hillary are night and day. Two different personalities -- same person. The medical profession has a word for that condition: schizophrenia. Nothing against schizophrenics, but I don't think it's a good idea to elect one as president. Do you? Five years after U.S. and British forces swept into Iraq and toppled Saddam Hussein, many Iraqis are asking if the violence and upheaval that turned their lives upside down was worth it. The human cost is staggering -- anywhere between 90,000 and 1 million Iraqi civilians killed, according to various estimates; nearly 4,000 U.S. soldiers dead; while 4 million Iraqis are displaced. "I think the thing that inspires me the most about Barack Obama is that he really is going to be the president of the United States. You know, he's not going to be the president of the top 10%, or the president of the most powerful corporations, or the president of the most powerful lobbyists. He's going to be the our president. He's going to speak for us. Because we put him there." Scorecard: Obama 13 caucus wins; Clinton three. It will come as a surprise to many people that there are rules in politics. Most of those rules are unwritten and are based on common understandings, acceptable practices, and the best interest of the political party a candidate seeks to lead. One of those rules is this: Do not provide ammunition to the opposition party that can be used to destroy your party's nominee. This is a hyper-truth where the presidential contest is concerned. By saying that only she and John McCain are qualified to lead the country, particularly in times of crisis, Hillary Clinton has broken that rule, severely damaged the Democratic candidate who may well be the party's nominee, and, perhaps most ominously, revealed the unlimited lengths to which she will go to achieve power. She has essentially said that the Democratic party deserves to lose unless it nominates her. As a veteran of red telephone ads and "where's the beef" cleverness, I am keenly aware that sharp elbows get thrown by those trailing in the fourth quarter (and sometimes even earlier). "Politics ain't beanbag," is the old slogan. But that does not mean that it must also be rule-or-ruin, me-first-and-only-me, my way or the highway. That is not politics. That is raw, unrestrained ambition for power that cannot accept the will of the voters. More BTW: If you agree with Gary Hart, please sign the petition in the previous post. "Obama Supporters Who Will Not Vote For Clinton in November"
Take a few minutes and watch this very moving "last lecture" by a young professor to his prized students--his children--and to all of us. Enable your dreams and the dreams of others. The Clintonistas are everywhere today spreading falsehoods about being back in control and claiming momentum towards the nomination. Only one problem: Even with the aid of Rush Limbaugh and cross-voting Republicans looking to aid Hillary and hurt Barack Obama, Barack still finished yesterday with his delegate lead in tact--and there's no way Hillary can catch up. The truth is that Hillary saw her massive leads in Texas, Ohio, Rhode Island and Vermont diminish over the course of a few weeks. While she had to win big, Obama neutralized her advantages and came out with a tie in delegates earned. The real results: Obama won more delegates than Hillary in Texas and Vermont; and Hillary won more in Ohio and Rhode Island. Our projections show the most likely outcome of yesterday's elections will be that Hillary Clinton gained 187 delegates, and we gained 183. That's a net gain of 4 delegates out of more than 370 delegates available from all the states that voted. For comparison, that's less than half our net gain of 9 delegates from the District of Columbia alone. It's also less than our net gain of 8 from Nebraska, or 12 from Washington State. And it's considerably less than our net gain of 33 delegates from Georgia. Having failed to make up ground, Hillary's task is now even more taunting. Of the 14 or remaining primaries (assuming Michigan and Florida do overs), Hillary will have to get something like 97% of the remaining delegates in order to win the Democratic Party nomination out right. In addition to winning more states than Hillary (25.5 vs 11.5), Obama has a comfortable margin in total votes cast (12,890,000 to 12,130,000). Hillary's strategy thus far has been to use fear of change, fear of black man as president and fear of a terrorist attack, along with assorted other untruths, against Obama. She's even accepted the active support of the country's harshest rightwingers hellbent on preventing an Obama presidency, and she's betrayed all of Obama's Democratic supporters by saying that only she and John McCain are prepared to be president but not Senator Obama. So after yesterday, Hillary's no closer to winning the nomination on her own, yet her campaign is even more committed to using shameful tactics that can only gravely damage Obama's chances in the fall should he be the party's nominee. Puerto Rico to Pick the Next U.S. President? It may not be so crazy. It's possible that tomorrow's Super Tuesday II results will give both Obama and Hillary enough to continue their battle through to the end. What's interesting is that the final primaries in June happen in Puerto Rico and the U.S. Virgin Islands -- and they could prove decisive. Really. May be it's just me, but that thought is just a tad surreal. It's like something out of a Latin American "surreal realism" novel in which things are upside down and nothing that you see or hear is as it appears. Think about it...Puerto Rico Commonwealth voters determining the next president of the U.S.! It'll be like "Livin La Vida Loca"-- but in a good Gabriel Marquez sort of way. If Barack Obama defeats Hillary Clinton in Texas or Ohio tomorrow, he will take control of a unified Democratic Party and enter the race against John McCain with an already-established reputation as a political giant- killer. John McCain will be transformed from despised RINO (Republican In Name Only) and favorite whipping boy of the loony right, to political hero and savior of the GOP and the country. Already he's inherited many of Bush/Cheney's Industrial Military Complex backers. Therefore, it makes sense that McCain's Democratic opponent be someone with the proven ability to take down a revered political icon. Hillary has struggled against a newcomer and does not exhibit any of the agility, judgement, stamina and campaign smarts necessary for the task ahead. The logical choice to play David to McCain's Goliath is Obama. Am I wrong? - Clinton Camp Damaged By Fallout Over Obama Photo. . .
Click here for The 'Skeeter Bites Report. 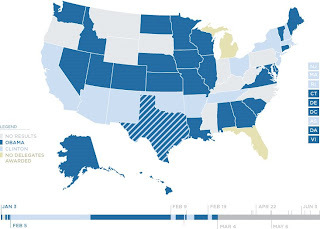 Over a year ago, I wrote that the new primary schedule would give America's growing Latino voting population a potentially decisive voting bloc. We've seen evidence of this trend in California, Nevada, New York and elsewhere, but it's in Texas, and especially among younger Latinos, that is proving most significant. 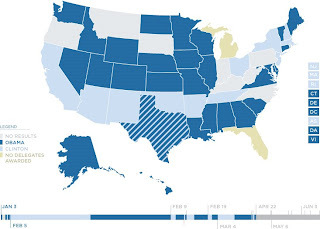 The power of that fast-growing slice of the Latino vote may soon be put to the test in Texas, where Democratic presidential candidates Hillary Rodham Clinton and Barack Obama are competing fiercely for the support of Hispanic voters in the state's March 4 Democratic primary. About 20 percent, of 2.6 million, registered voters in Texas have Hispanic surnames, and about a third of the state's eligible Hispanic voters are 18 to 29. ''If they turn out in bigger numbers than they have in the past, it could be a real turning point. It's this very large and growing untapped pool,'' said Roberto Suro, a founder of the Pew Hispanic Center and a journalism professor at the University of Southern California's Annenberg School for Communication. Full Article Si, Se Puede! Considering that Hillary has decided to attack Barack Obama by using fear, it's good to know that Bill Clinton said in '04 that it is better to vote for someone who's message is hope over fear. Since Bill is a person of principle, he's letting voters know that Obama's is his candidate. Shhhhh! Just don't tell Hillary. The video was posted on YouTube by nocoronation. This pro-Obama version of "La Bamba" by Austin band Cerronato urges everyone to vote for Obama. It was posted on YouTube by sixteencoaches. This one too has a good beat and is easy to dance to. Vota Obama! Cumbia de Obama - New Music Video! 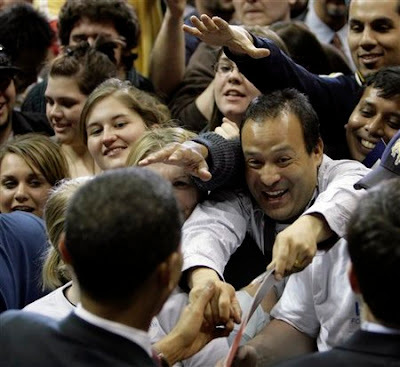 What's so much fun is to see the explosion of excitement and creativity that so many young people inspired by Senator Barack Obama are bringing to the public square during this primary season. Here's yet another terrific Latino-produced video featuring Senator Barack Obama--this one with a Cumbia beat. It was sent to me by Sasha Costanza-Chock and produced by losobamaleros. BTW: I love the intoxicating rhythms and sounds of the Cumbia. Oh -- And wouldn't it be fun to finally have an American presidente con ritmo. Sasha says ¡Clickalo! Me, too. ¡Clickalo! Interesting video of Senator Barack Obama spending the day doing the work of Ms. Pauline Beck, a homecare worker and SEIU member. The video captures him doing dishes, preparing a meal, folding laundry and making a bed--and he seems geniunely comfortable doing the chores and talking about the importance of Ms Beck to the health and wellness of her patient. BTW: When viewing this video try imagining Ms Hillary, Bill, W, Cheney, or any other of their types, in Obama's place. Can not imagine it, right? Me neither. What a difference it'll make to finally have a president that understands, values and respects the Paulines of the world and the people they care for. This YouTube by txriotgrrl gives viewers a sense of what many Texans at the grassroots are doing in support of change and the Obama campaign. Nice beat. Easy to dance to. Filled with hope. I give it a 10.